In the recent times, solar power tariffs have seen a great fall. In a very recent event, Abu Dhabi received the cheapest solar power tariff in a combined bid at 2.42¢/kWh. Also, some time back, Chile received a tariff at a bidding of 2.91¢/kWh. Now, in a record low, India has received a bidding at 0.04$/unit for a solar park in Rajasthan. The power, coal, renewable energy and mines minister Piyush Goyal said in a tweet that the latest solar power auction at Bhadla Solar Park 3 sets new record with electricity tariff of 0.04$/unit. This bid is 18 per cent lower than the average costing which comes on behalf of the coal-fired plants which produce electricity. Along with Saurya Urja Co. of Rajasthan Renewable Energy Corp. Ltd., the 500 MW solar park is being developed by Solar Energy Corporation of India (SECI). For the 300 MW project, the received biddings were scaled at par approximately at 0.04$/unit. 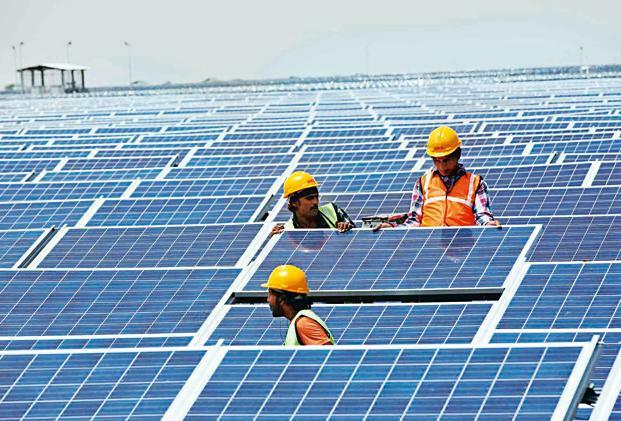 The renewable energy minister Piyush Goyal also added that the country wants to deploy more than 100 gigawatts of solar power by the year 2022. Solar energy seems to be a fast-developing domain for India as it is close to being the third biggest solar market in the world. Since the past year, the capacity has rocketed to a 76 percent increase. India is also the world’s third largest greenhouse gases’ emitter. The recent record falls in the economy can be a good environmental news. The solar sector has a brighter picture for the Indian economy. Tapping its natural resource potential, India has magnified its capacity for solar energy in the past three years. By 2030, the developing economy aims to create 175 gigawatts of solar energy and other natural resources like wind and biomass energy. The Indian Prime Minister, Mr. Modi has said that the country’s energy policies are committed to generate 40 per cent of the country’s electricity from non-fossil fuel sources by 2030.